Filed to: Hello!Filed to: Hello! A Wednesday report from The Atlantic outlining the deal Democrats struck with Donald Trump to package Hurricane Harvey relief with a three-month extension of government funding and a deal to raise the debt ceiling included a surprise appearance from America’s more visible first daughter. 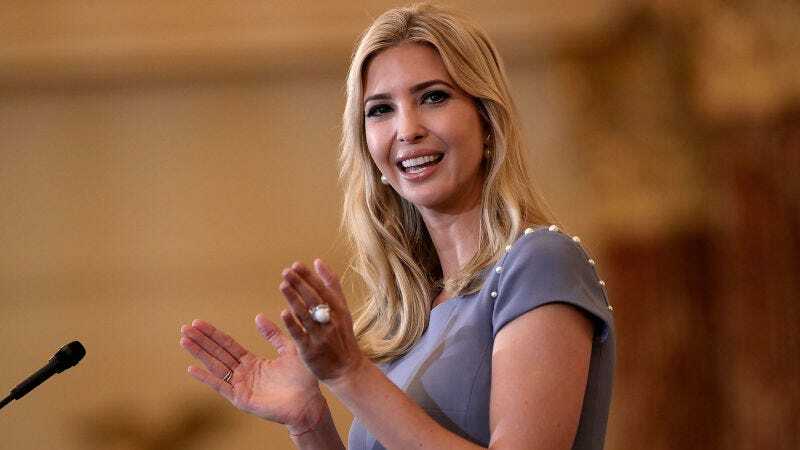 Ivanka Trump joined the meeting near its conclusion to “say hello” to the Democratic and Republican leaders gathered for the meeting and, perhaps, her father, too. The Atlantic reports that “Trump entered the room to say hello to the leaders and the discussion veered off-track.” According to one aide, “Republican leaders were visibly annoyed by Ivanka’s presence.” A spokesperson for Paul Ryan was quick to deny that he was “annoyed,” telling the magazine, “That’s not true.” Perhaps Ryan was pleased to see Ivanka Trump but her presence at the meeting raises a trivial question certainly worth wild speculation: Why does Ivanka Trump keep dropping in on her father’s meetings? It isn’t the first meeting that Ivanka has made an appearance. During a July interview with the New York Times, Ivanka interrupted because she, “just wanted to come say ‘hi.’” And in another July interview with the Wall Street Journal, she dropped in mid-interview because, as she said, “I wanted to come by and say hi.” Ivanka also congratulated WSJ reporter Gerard Baker on his “very nice” recent editorial. Then, of course, Ivanka also sat in on her father’s G20 leaders meeting in July (no word on whether or not she just wanted to come and say “hi!”). Maybe Ivanka is just really friendly and loves coming by to say hello. Maybe she loves meetings; maybe she’s simply trying to find authentic connections in a bleak landscape of existential dread. Or, perhaps she’s trying to overcome that gloomy feeling of “essential irrelevance.” Even more likely, Ivanka still holds out hope that despite that perfect and gossipy Vanity Fair report outlining her “irrelevance” in splendid detail, she can still enact legislation worthy of her empowered, working woman self-image. Or maybe she’s doing it to be helpful to her father, dropping in at key times to distract his guests from what they were talking about, or to de-escalate a tense moment. Indeed, according to a report from Politico, Ivanka “kicked off her own tax reform sales pitch on Wednesday morning, holding an off-the-record meeting with conservative activists such as Ralph Reed and Grover Norquist in an effort to sell them on her idea of expanding the child tax credit.” Ivanka has been working on this proposal, a $500 billion tax credit program that would roughly double the current child tax credit, since joining her father’s staff. But, as important as the tax credit expansion might be to Ivanka, it’s clearly not a top priority for other Republicans, including the president. Politico notes that the White House’s tax goals, “vaguely mentioned tax relief for families with children.” In addition, the plan has always been unpopular among fiscal conservatives.